For a very long time, the Japanese home market has envied the big supersports models destined, principally, for the USA and Europe. 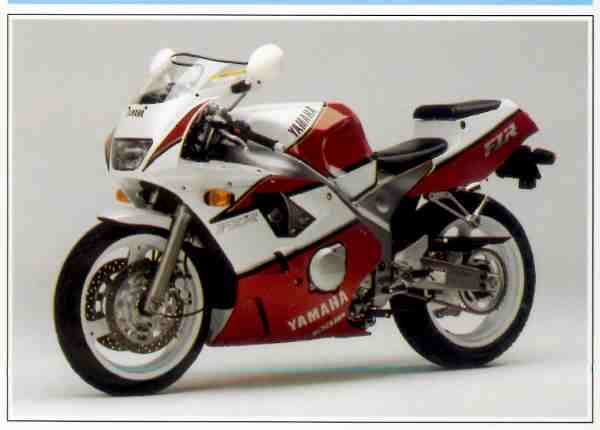 In the 90’s the trend is being reversed, for the 400cc machines developed for Japan have become such high performers that the rest of the world dreams of profiting by them. Now prayers are being answered, and among the outstanding new models reaching other shores is the Yamaha FZR 400R . Crowned with success in Japan, the FZR 400R is an exclusive and uncompromising sports machine that has nothing to be ashamed of in comparison with the largest-capacity bikes, with which it shares all the latest advanced technology. The four-cylinder engine is suspended below two aluminum box girders as on contemporary Grand Prix machines. The inclined cylinders, which allow the use of straight-line intake tracts, the 16-valve head, and the Exup system of a valve in the exhaust, give the machine a fierce temperament allied to great flexibility and an astonishing power output equivalent to 152 hp per liter. Lively and agile, the FZR 400R draws full profit from its sensational power/weight ratio. Its riders discover that a highly tuned machine of moderate displacement is more efficient, in most cases, than a "big banger," which needs a very particular environment to give its best. Maximum Speed: "over 125 mph"
Apart from its overall dimensions, tbe Yamaba FZR 400R resembles tbe FZR 1000 in every detail.